Review posted January 21, 2015. Eerdman's Books for Young Readers, Grand Rapids, Michigan, 2014. 36 pages. This lovely picture book, with elaborately illuminated capital letters and nice variety in the illustrations, is based on a detail in a letter written by a twelfth-century French Benedictine Monk. He wanted to replace a manuscript that had been lost by brothers who had gone to a remote location to pray. Apparently, the perils of the soul were not the only dangers there. Peter wrote: "And send to us, if it please you, the great volume of letters by the holy father Augustine... For it happens that the greater part of our volume was eater by a bear. The creators of this book play with that idea. Brother Hugo, the monk who lost a manuscript is assigned a penance of replacing the manuscript himself. 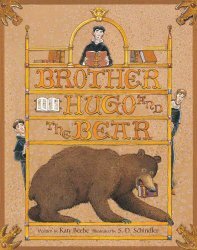 He sorely sighed and sorrowed in his heart, for he knew that once a bear has a taste of letters, his love of books grows much the more. Brother Hugo must go to a distant monastery to get the book to copy, then prepare the parchment and supplies and get all ready before the work of copying begins. And then he must try to keep the borrowed manuscript from the hungry bear. The author plays with language along the way, giving a taste of medieval without being incomprehensible to kids. Readers will understand that the author, like the illustrator, has embellished the tale, with a result that is a lot of fun. And it makes the "My dog at my homework" excuse pale in comparison.